Crazy about chalkboards? Me, too! I’m always looking for ways to bring chalkboard ideas into our home, or paint something unexpected with chalkboard paint. 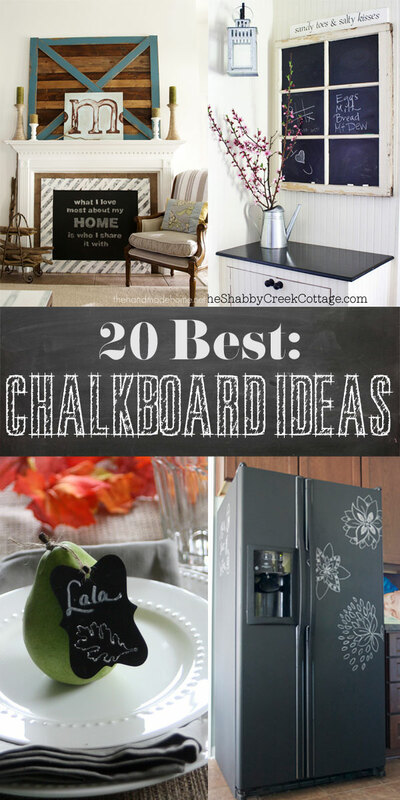 Here are 20 of the best DIY chalkboard ideas around! I love chalkboards too! I have an old wooden tray on my buffet that is now a chalkboard menu. I’ve also done “chalkboard-footed wineglasses” as a gift. But, my favorite is my chalkboard PANTRY DOORS…love them! What IS IT about chalkboard? Memories from grade school? Or the ability to change as the mood strikes? We have gutted the house and are remodeling one room at a time. The wall in the dining room that has the opening to the kitchen will be ALL blackboard.